No one expects golfing, boating or downhill skiing to be anything but a financial drain. Well guarded secret of sport fishing is that it is a lot cheaper to buy fish in a store. There are very few activities/hobbies that can be financially beneficial all along. Perfume making is one of them! Not only you can economically produce hand creams, body butters, soaps, shower gels, massage oils, aromatherapy blends, sprays, bath balls, salts, etc. but you can organize family & friends events creating these. Unscented cream bases, gels, liquid soaps, massage oils can be purchased in bulk volumes affordably, while aromas can be created with just 2-3 essential oils. 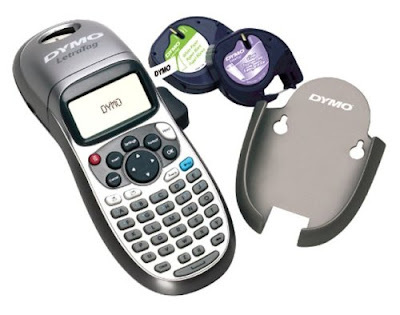 Nice and reasonably priced packaging is also available from multiple suppliers. This is an Airless Dispenser Clear with Silver Cap ($3) from New Directions Aromatics. It does look rather professional and can be even used as a gift! Recently I received two versions of Indian Nagarmotha (Cypriol) from New Directions Aromatics and Tom's Incense. The last one appeared to be slightly stronger and deeper, so I decided to give it a try in the next formulation. Odor can be described as earthy, spicy and wood-like. Nagarmotha works as an excellent bridge between woody base notes of Sandalwood, Vetiver and middle floral notes such as Jasmine, Rose. 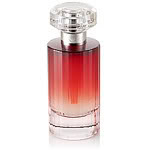 One of the most successful fragrances using Nagarmotha is Magnifique by Lancome. My formula has more Jasmine and Rose and this is how I liked it. Aldehyde C9 is giving a nice lift to the perfume. Recently I received Mimosa Absolute from The Good Scents Company and was so amused by the consuming comfort of mimosa that I could not resist developing a perfume around it. 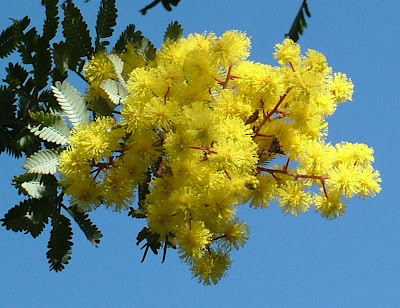 Historically there are several dimensions how mimosa can be incorporated into a perfume. For example both Bvlgari Pour Femme and Amarige Mimosa de Grasse Millesime by Givenchy add sweet and fruity perspective to mimosa. 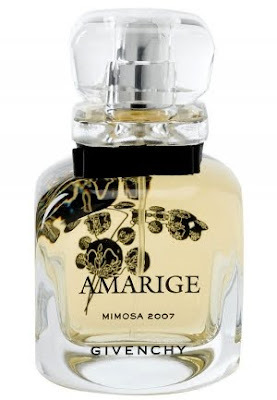 But I felt captivated by how mimosa plays with Vetiver, Jasmine, Neroli and Rose Geranium in Givenchy Harvest 2007 Amarige Mimosa. Mimosa Absolute cannot be dispensed by drops and must be diluted first in perfume alcohol. It is rather difficult to have a consistent concentration of such dilution. The above formula is referring to undiluted Absolute (intensity: 5% Mimosa Abs = 10% Vetiver Oil). So, when repeating the formula please verify Odor Intensity of diluted Mimosa Abs and update the formula accordingly. Sometimes fragrance formulas might consist of 20-50 different essential oils and aromatic compounds. That is why proper dispensing of particular number of drops of ingredients is very important. Can you imagine spoiling the formula by overdosing one of the last elements... Well, occasionally it may bring you a success (ex., creation of Chanel N5) but for the most part you would just waste cherished time. DO NOT use passive built-in droppers (first option on the photo). While this setup might be acceptable for some applications (such as dispensing oils into a burner or mixing fragrance into a massage oil base) this is entirely unacceptable for perfume making because speed of dispensing drops is highly unstable. Built-in (screw on) glass pipettes or disposable plastic ones produce much better (stable) results. You can find different pipettes, but so far I prefer small ones available from Creating Perfume (price: $5 for 50 pipettes). Sometimes, when you are doing a lot of mixing you can also use standard plastic straws. The ones sold in Ikea are rather thin and semi-tranparent ($1.99 for 200) making them an excellent option for dispensing oils. Have fun with you creations! Most PMS Wellness aromatherapy recipes are simple floral combinations of Neroli, Clary Sage and Rose Geranium. I didn't find that combination to be soothing enough and decided to build a recipe on a quality woody base of Patchouli and Vetiver, add traditional floral dimension using Jasmine, Ylang Ylang and Rose Geranium. Clary Sage and Roman Chamomile give depth while a hint of Melissa finishes the formula with a light top note. Use blotters; don’t spray anything on your body. Clearly mark blotters (do not rely on your memory to recall which perfume is on which blotter). Record your first impression on a scale 1-10 on the other side of the blotter (so that you can later test it again without being influenced by an earlier rating). Keep all blotters even if you didn’t like some perfumes at first site. 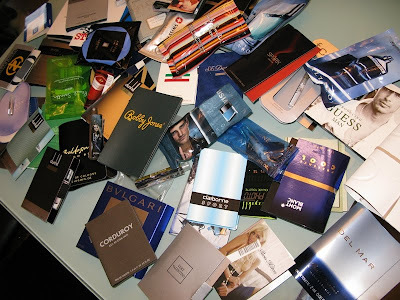 Test again in an hour or two by sorting blotters by how you liked perfumes. Now you can assign your final rank on the scale 1-10. Sometimes you may wish to revisit blotters in half a day to study perfume dry out (base notes). Majority of modern perfumes would not change much though. From my personal experience I find it rather difficult to study more than 5-7 new perfumes at a time. Studying perfumes in a department store might be a good start, but more often than not I feel intimidated by proactive sales people (especially if I don’t plan to make a purchase at the time). Also at a later time I might want to revisit particular perfume (or particular type of perfumes) in search for new discoveries and inspiration. For these and other reasons I prefer to actually get perfume samples (1-2 ml vials) and study perfumes in the comfort of my home. Some stores would give you samples generously, but for the most part I would simply source them online (priced $1-$5/sample). Please feel free to add other sources as comments to the post. Normally as concentration of an odor increases so does the intensity of the scent. For example, Musk Xylene has Odor slope of 0.30 that means that in order to achieve a 2 fold increase in odor intensity concentration should be increased 10 times! While Odor Slope variations can be rather pronounced, it is generally Ok to use 0.30 as the average value. But relationships between concentration and intensity of odors are rather different. For some essential oils intensity of the odor may noticeably increase with higher concentration of the odorant, while for other oils change in intensity may not be so obvious. Low-slope odorants at first may appear as week in 100% concentrations, while higher-slope seem overpowering at full concentration. Comprehensive tables for Odor Slopes are hard to find (if you know a good reference, please add it here as a comment). What is important to understand though is that when you double concentration of an odorant its intensity on average will be increased by mere 23% (2^0.3=1.23). But weekend perfumers are so addicted to measuring everything in drops that very often simple dilutions are also done by counting drops. And this is a rather serious mistake, because size of a drop depends on the surface tension of the ingredient (especially great the difference between the drops of alcohol and essential oils) and as the result we can get a dilution which is substantially different from what we intended to achieve. And since most of weekend perfumers work with very small amounts of materials the best metrics would be volume. Step 6: Now you can use marked toothpicks to compare the strength of the diluted oil with Vetiver Etalon (see Weekend Perfumer’s Sniffing Technique). Most often than not mixing different aroma ingredients produce best results when mixed oils have the same odor intensity and no particular element stands out. Otherwise the whole accord appears to be unbalanced and unsophisticated. Odor intensity of essential oils and aromatic compounds vary greatly. For example, it will take over 100 drops of Sandalwood Oil to balance just 1 drop of Cistus (and this is even without taking into account effect of Odor Slope which will be discussed later). Most of the time information about Odor Strength of oils is limited to “strong/medium/weak” ratings. Obviously, this is not enough. My search for authoritative sources of such information didn’t produce much except repetitive statements that it is very subjective and that even the same oil from multiple suppliers might have drastically different Odor Intensity. Even knowledge of Vapor Pressure and Molecule Weight are not very helpful, because human nose processes smells in rather unpredictable ways. First we should choose particular oil that will be used to compare with all the other oils in the library. I would recommend VETIVER. It has a very distinct Odor, which can be described as deep smoky-dry, earthy-woody and slightly sweet. It is easier to recognize Vetiver in simple combinations. And finally, this is a rather common and affordable ingredient. Most supplies will have Vetiver in their stock. 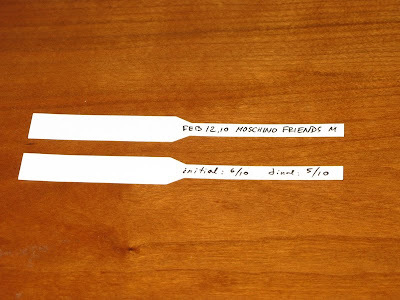 The process of comparing Odor Strength for oils is based on Weekend Perfumer’s Sniffing Technique using ordinary toothpicks instead of blotters as it allows a lot better precision and easier handling. Please mark the first toothpick in a special way and dip it 5mm (1/4 inch) into undiluted Vetiver oil – this will represent Odor Intensity of a single drop of a 10% Vetiver dilution (5 cm / 2 inches of a toothpick absorbs 1 drop of an oil). Note: majority of oils should not be smelled directly from bottles as it may temporarily reduce your ability to perceive odors. If Tested Oil is weaker, you may try to dip new toothpick less than 5mm, but that process becomes a little tricky. I would recommend making a 10% dilution of the Tested Oil using Perfume Alcohol. Then each 5mm will correspond to 1% of the Tested Oil. For example, if 10mm dip of a 10% dilution of the oil produced a similar Odor Strength to the Etalon that means that: 10% Vetiver = 2% Tested Oil. And if 10% dilution is still too strong to provide precise results, continue with further diluting the oil down to 1% and do the testing. Some oils such as Oakmoss (EOS), Leather (TGSC), Rose De Mai (EOS), Violet Leaf (E7) and others require 0.1% dilutions not to overpower 10% Vetiver Etalon! I have summarized results of my tests of my own library of essential oils and aromatic compounds in AromaLibrary.com Clearly, this is an ongoing process as rather often I would review my own findings at a later date and I would suggest to consider data regarding Odor Strength only as a guideline for your own discoveries. 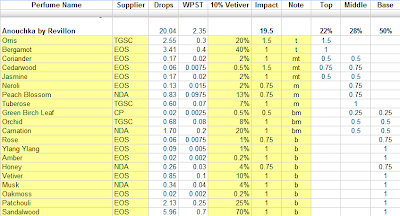 Ok, and here is the main treasure: continuously updated table of Essential Oils and Aromatic Compounds in Google Spreadsheet format. Good luck with your weekend creations! Anouchka by Revillon is a Chypre-Fruity feminine perfume which is marked by active use of aldehydes. Personally I am not a big fan of waxy / soapy perfumes, but I am taken aback by unorthodox combination of floral and fruity notes and developing complexity of that perfume. Another element that is missing from my recipe is Cistus. Dry accent is being promoted through the use of Vetiver instead. Pi by Givenchy is one of my favourite perfumes. I adore effective combination of sweet and herbal notes. Anise presence changes the aroma and makes it round together with Rosemary. If you are sensitive to Tarragon you may choose to reduce it down to 2 drops. This perfume is designed for men and the main theme of Chocolate and Vetiver was borrowed from CANNABIS SANTAL EAU DE PARFUM by Fresh. The original perfume to me sounded like chopped with an axe with couple combinations standing out and I didn't like their Cannabis note at all. But it certainly captivated me with the unusual introduction of chocolate note into a dry woody base. In my combination I decided to experiment with unusual fruity compounds replacing Cannabis in the heart note. The process of perfume making can be simple to extremely complicated. We have tried to make the process as simple as possible. 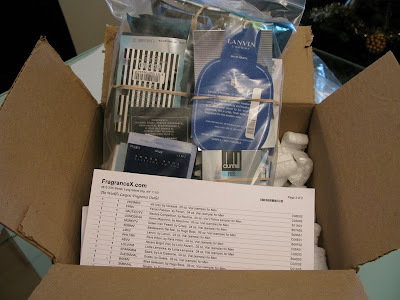 Hopefully we have achieved a useful site that will help you grow as a perfumer. In time, we plan to introduce more aroma and bottle options. We want to encourage you to experiment and try new combinations. We hope you will share your successes and flops with us.